No time for making selections? Learn how to create a quick and easy Color Splash effect in Photoshop with just a Gradient Map adjustment layer, a layer mask and a brush! Great for nature and landscape photos. For Photoshop CC and CS6. Written by Steve Patterson. In this Photoshop tutorial, we'll learn a super easy way to add a color splash effect to a photo! A "color splash", also known as "selective color", is where we convert an image to black and white and then restore the color in just one area. Usually, we restore the color in a specific object, like a dress or a flower. In fact, I cover a simple way to do that in our Easy Selective Color Effect tutorial where I bring back the color in a woman's red dress. 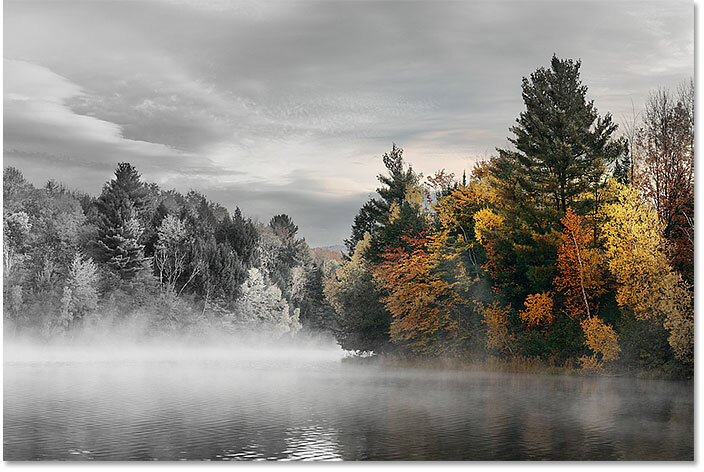 But for certain types of photos, especially outdoor landscapes, it can be more effective to restore the color not in any one object but in a general area. 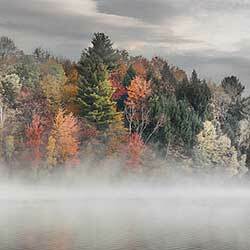 Often, landscape photos lack a clear subject, leaving the viewer's eye to wander. By limiting the color to just one area, like the leaves on a tree or the water under a bridge, we simplify the scene by bringing focus to that area. This can be a great way to create a more interesting and compelling image, and it's also just a really cool effect and a lot of fun! And, because we're not choosing anything specific in the image, there's no need to make any time-consuming selections. Usually, a single click with a brush is all we need! To create the color splash effect, we'll use a Gradient Map adjustment layer to quickly convert our image to black and white. Then, we'll use the Gradient Map's built-in layer mask, along with Photoshop's Brush Tool, to instantly restore the color in a single area. 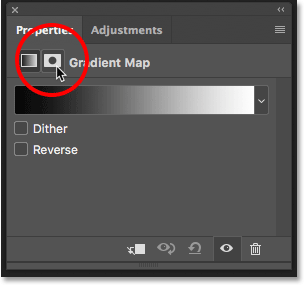 Finally, we'll fade the color so that it blends in better with its black and white surroundings, and we'll do that using the layer mask options in the Properties panel. Once you know the steps, the entire color splash effect takes only a few minutes from start to finish. Let's see how it works! I'll be using Photoshop CC but everything is fully compatible with Photoshop CS6. The final "color splash" effect. The default Foreground (upper left) and Background (lower right) colors. 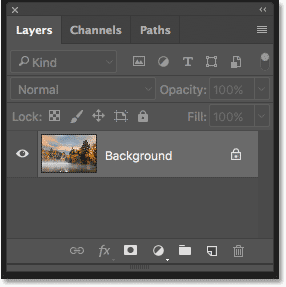 The Layers panel showing the original image. Choosing "Gradient Map" from the menu. 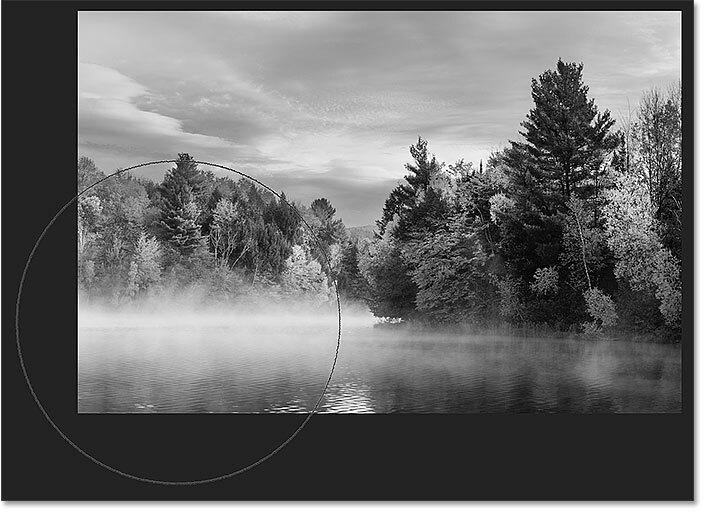 The Layers panel showing the new Gradient Map adjustment layer. 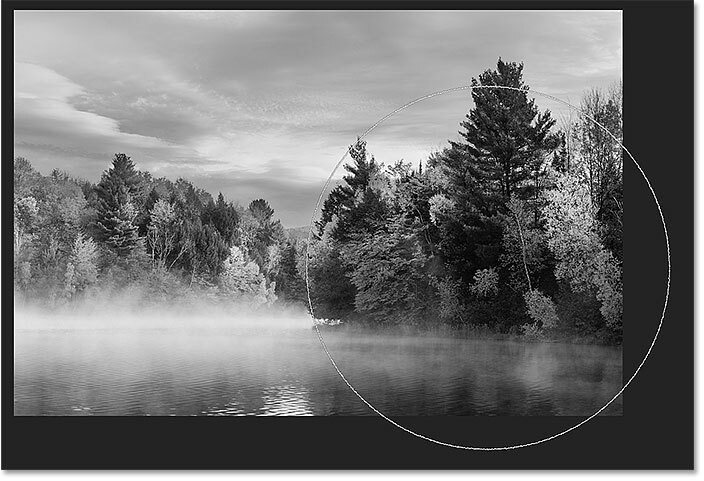 The image after converting it to black and white using the Gradient Map adjustment layer. The layer mask thumbnail for the Gradient Map adjustment layer. 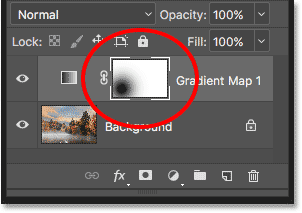 Photoshop uses your current Foreground color as the brush color. So to paint with black, we need to set our Foreground color to black. 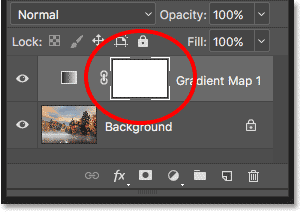 Earlier, when we reset our Foreground and Background colors to their defaults, Photoshop set the Foreground color to black and the Background color to white. So you might think we're good to go. The Foreground and Background colors have been reversed. Press "X" to swap the Foreground and Background colors. 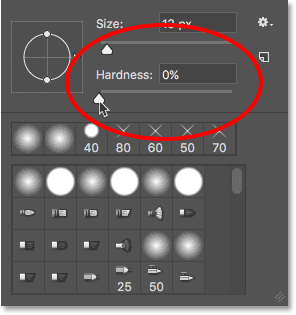 Lower the brush hardness down to 0%. Resizing and positioning the brush cursor over the area to colorize. The color in the trees on the right has been restored. Selecting "Undo Brush Tool" from under the Edit menu. Moving and resizing the brush over a different area. The color in a different area has been restored. The layer mask thumbnail showing where we clicked. 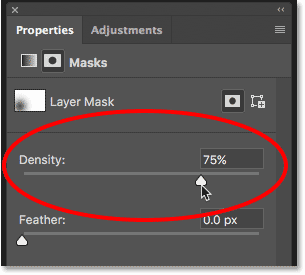 Clicking the Layer Mask icon in the Properties panel. Lowering the Density value in the Properties panel. And there we have it! That's how to create a quick and easy color splash effect using a Gradient Map adjustment layer and a layer mask in Photoshop! Check out our Photo Effects section for more Photoshop effects tutorials!